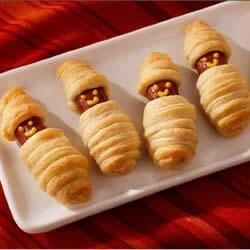 "For your next Halloween party, create spooky mummy dogs with strips of crescent dough for the bandages and tasty Hillshire Farm® Lit'l Smokies® for the mummies." Unroll dough, separate at perforations, creating 4 rectangles. Press perforations to seal. With a knife or pizza cutter cut each rectangle lengthwise into 8 strips making a total of 32 strips. Wrap one strip of dough around each Lit'l Smokies(R) stretching dough slightly to look like bandages, leaving tip exposed to create face. Place on ungreased cookie sheet. Bake 12 to 14 minutes or until golden brown. Draw features on tip of Lit'l Smokies(R) to create face. Serve with mustard or ketchup, if desired. A fun way to serve French toast and smoked sausage for a crowd-pleasing brunch. I made these for my family last Halloween, and they were a hit! So easy to make and very filling. They are best with plain yellow mustard. These are excellent! I used beef smokies and served warm with a side of grape jelly. Very easy and tasty! I could not believe how fast these were devoured. Fast and easy, and the kids had fun making them with me! I've already given this recipe away to friends :D Thank you!